The winner of two Pulitzer Prizes and several other accolades for his dry, sulky novels chronicling the life of ex-basketball player "Rabbit" Angstrom, John Updike has become a legendary American author. He turns out the flaws in his characters and relationships, simultaneously affirming their worth. Rabbit at Rest is the fourth of five John Updike Rabbit novels, all of which focus on their central character Harry Angstrom. 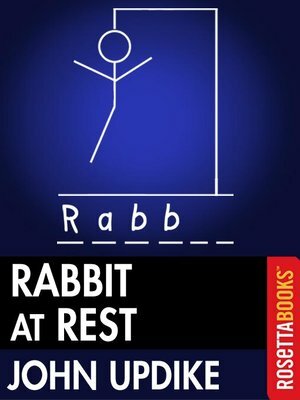 In Rabbit at Rest, Harry Angstrom has acquired heart trouble, a Florida condo, and a second grandchild. His son, Nelson, is behaving erratically; his daughter-in-law, Pru, is sending out mixed signals; and his wife, Janice, decides in mid-life to become a working girl. As, though the winter, spring, and summer of 1989, Reagan's debt-ridden, AIDS-plagued America yields to that of George Bush, Rabbit explores the bleak terrain of late middle age, looking for reasons to live. John Updike was born in 1932 in Pennsylvania and has published more than 30 novels plus works of poetry, short stories and essays. John Updike is only one of three Americans to win two Pulitzer Prizes (the others are Booth Tarkington and William Faulkner). He has won many other prestigious literary awards. RosettaBooks is proud to publish the complete Rabbit set Rabbit Run, Rabbit Redux, Rabbit is Rich (National Book Award, Pulitzer Prize), Rabbit at Rest (Pulitzer Prize) and Rabbit Remembered.